Slovak Catholic Mission in London is ethno-linguistic parish of the diocese of Westminster (www.rcdow.org.uk). It means also that it’s part of Westminster Roman Catholic Diocese Trust (WRCDT); Registered Charity Number: 233699. Back in 1949 Fr Jan Lang SJ founded the first Czech-Moravian-Slovak Mission in London following a decision of the Bishops’ Conference in Slovakia. In 2007 the Slovak Catholic Mission (SCM) in London became a new and independent entity under the Archdiocese of Westminster. Although the SCM is based in London, there is a new centre in Peterborough and two more are soon to be opened in Birmingham and Manchester. Fr Tibor Borovsky was appointed a Chaplain in July 2010. We are a young and vibrant community and we gather for Mass in the Church of Our Lady of La Salette and St Joseph at 14 Melior Street in London SE1, which is in walking distance from London Bridge Station. We share this Church with the English-speaking community and celebrate Mass together on Fridays. Why was year 2013 so special for us? Apart from celebrating the Year of Faith, we celebrate the 1150th anniversary of the arrival of Saints Cyril and Methodius in Great Moravia. 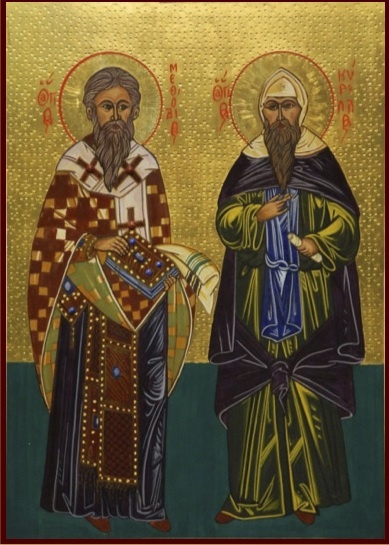 Saints Cyril and Methodius were brothers from Thessalonika (Greece) who came to Great Moravia upon the request of Prince Rastislav of the Bratislava region in 863. Rastislav asked the Byzantine Emperor Michal III to send Christian missionaries with a knowledge of the language of the Slavs who would be able to teach the Gospel in their mother tongue. Cyril and Methodius became teachers of the Slavs. They established the first Slavonic script (the Glagolitic script) and and translated the New Testament and The Old Testament, except for the books of Maccabees, in the old Slavic language, which was later, throughout centuries modified and is known as Old Church Slavonic language. Thanks to their hard work and effort, the Slavs could understand the words said during the Mass because until then the Mass was exclusively in Latin. We wish to follow the legacy of Saints Cyril and Methodius in building one, holy, catholic and apostolic church. Our hope is to become good missionaries and to proclaim the Gospel to all the nations. In this effort, we do not want to stand alone. We long to be joined with other Christians, to get to know one another and to be of mutual support in growing in faith. And therefore, we invite all the nations in London to come together in Christ.